Shankar Magical Rajinikanth's 2.0 has finally hit silver screens. With Akshay Kumar returning to the silver screen as the antagonist after 16 years. In one line 2.0 is a Must Watch with Powerful Visuals · Strong Acting ·Action-Packed · Great Special Effects · Intelligent ·Fresh · Great Ending · Hilarious. Much awaited 2.0 got released on today early morning around the world. Considering the biggest ever made movie in India with a wooping 550 Cr budget with Rajani, Akshay Kumar and Amy Jackson. The movie already in sensation with its pre-release money making of Rs.450+ crores. The plot of 2.0 feels familiar; in fact too familiar. There is no mystery in the supernatural occurrences that we see on screen, and for the entire first half, we are forced to wait for the mandatory flashback involving Pakshirajan (Akshay Kumar), the ornithologist who is the old man who we saw at the start of the film. Even the flashback doesn't hit us hard emotionally the way similar episodes in the director’s Indian and Gentleman made us feel. There is a distinct sense of just going through the motions in the first half. But, by now, plot is not what we go to Shankar's films for these days. It is the grand canvas in which this director mounts his oft-told stories that makes us look forward to his films. And in 2.0, we get spectacle that is satisfying. In the first half, we get some striking visuals - mobile phones crawling on the road, a forest of glowing phones, a monstrous bird that crackles with energy. There are also visual nods to Hollywood films like Aliens, Terminator 2 and even Ghostbusters. And yet, despite the entry of Chitti (Rajinikanth), the film seems to be missing a je ne sais quoi. We get an extravagant clash between Chitti and the giant bird, but that's all. Unlike its predecessor, the film doesn't find a way to inject humour and inventiveness into the proceedings. Barring a reference to the famous dialogue from Nayakan, the lines are hardly memorable, and the characters pretty functional. Even the sub-plot involving Dhirendra Bhora (Sudhanshu Pandey), the son of the first film's villain, Dr Bhora, is underdeveloped. 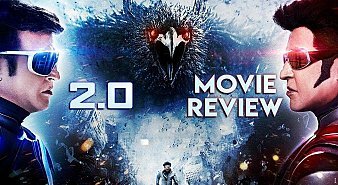 It is only with the entry of 2.0, which happens a little late than it should have, that the film gets some much-needed energy. As he did in the first film, Rajinikanth digs into this role with his inimitable style and performs with relish. There is even a punch line that he utters after Nila tells him that he is no longer the No 1, that sends fans into a tizzy. Akshay Kumar is also a solid presence as the antagonist whose heart is in the right place. And the climactic battle between 2.0 and Pakshiraja ensures that we get the bangs we deserved for our bucks. Even though some of the surprises in this segment have been let out in the trailer, Shankar manages to pack in a cute, little surprise that's 3.0 aka Kutti. If only had he found a way to get these two characters into his plot earlier, 2.0 would have soared. The VFX is beyond excellent and you can only enjoy it in 3D. Don't expect any story and worthy screenplay just you can watch for amazing visuals and FX. The first half moves incredibly fast but be prepared to get super confused. Over the intermission movie is getting engaged and started the big bang and theater screens get fire....worth to watch, incredibly first of its kind in Indian cinema.